Deaf And Unemployed: 1,000+ Applications But Still No Full-Time Job Despite technological advancements that allow deaf job seekers to communicate more easily with potential employers, applicants say they still face stigma that they can't do the job. 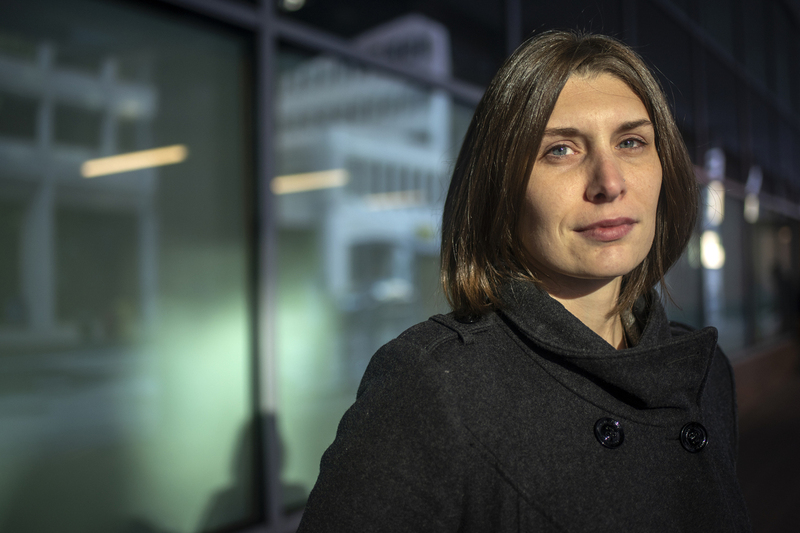 Amanda Koller is deaf and has struggled to find full-time permanent employment, an issue she attributes to discrimination in the hiring process against those with disabilities. Amanda Koller is getting her second master's degree. She has applied for more than 1,100 jobs in the past year. She hasn't gotten any full-time, permanent job offers. She is also profoundly deaf. The unemployment rate among the deaf is staggering. Fewer than 40 percent of those with a hearing disability work full time, according to the Yang-Tan Institute at Cornell University's analysis of 2016 American Community Survey data. 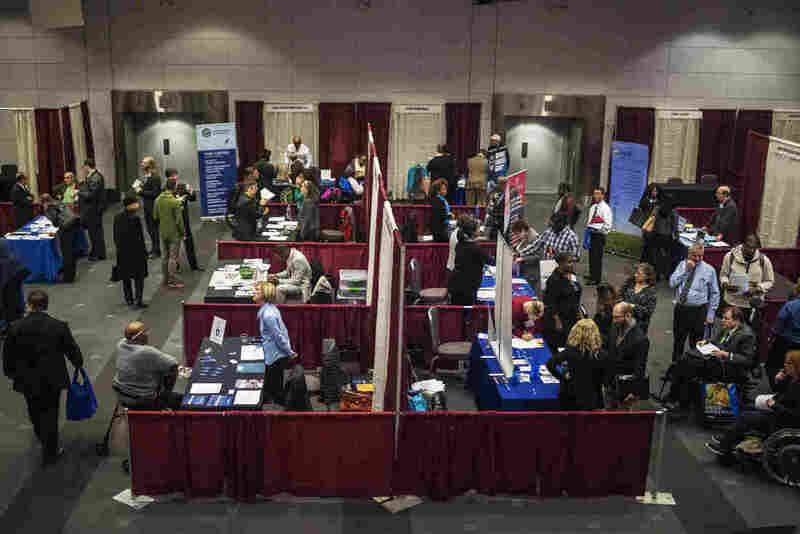 Despite improvements in technology and accommodations that are making it easier for deaf people to work and communicate, deaf job hunters say employers still don't believe they can do the work. 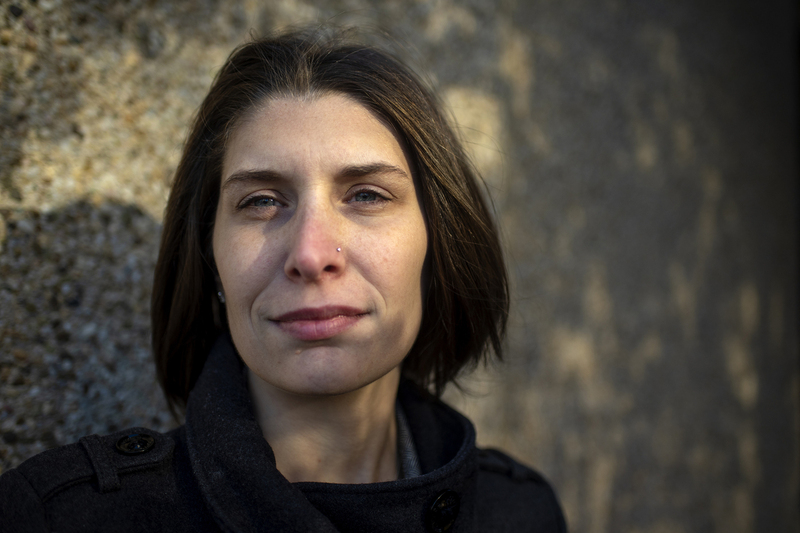 "I apply to grocery stores and I can't even get a job there," said Koller, who lives outside Washington, D.C. "If you can't hear or speak right, you're not going to get a job. I don't think it matters what the company is, or what your background and work experience is." If you can't hear or speak right, you're not going to get a job. On paper, Koller's background is impressive. She has a master's degree in public administration from Western Michigan University and a bachelor's in health sciences from Temple University. She's currently working toward a second master's in health care quality management from George Washington University. Many companies have been interested in interviewing Koller for entry-level positions, she said. That's where the trouble always started. When Koller told hiring managers she was deaf and preferred to interview in person so that she could lip-read, she says she was often ghosted or told that a phone screening was mandatory. Koller has tried to do interviews over a special phone that allows her to speak for herself and read a transcript of what the other person is saying, but the text often lags and the process is time-consuming. "People get so angry and say, 'I don't have time for this,' and they hang up on me," Koller said. Koller thinks she's hitting a wall because of her disability, but she has no way to prove it. Employers often said they went with a candidate who was a "better fit," without mentioning her deafness. Each rejection made Koller more determined to get a job. She woke up most days at 5 a.m. to look for jobs and obsessively submitted applications until 9 p.m. She kept an Excel sheet of every job she applied to. She did some consulting work to pay the bills. It wasn't enough. Her bank account was negative, her credit cards were overdrawn, her student loans were unpaid. She cried every day and even contemplated suicide. "I couldn't see a tomorrow; I couldn't see a future," she said. "I was angry about having a hearing loss." In October 2017, her significant other coaxed her to go to counseling. That cost more money. Now, the size of Koller's debt is over $200,000. The same month she started counseling, Koller discovered she was not alone. She was added to a Deaf/HH Job Seeker Network Facebook group, which has 4,700 members. Group members and other deaf individuals NPR spoke with have struggles that echoed Koller's — they have good educations and many qualifications, yet couldn't get entry-level jobs. 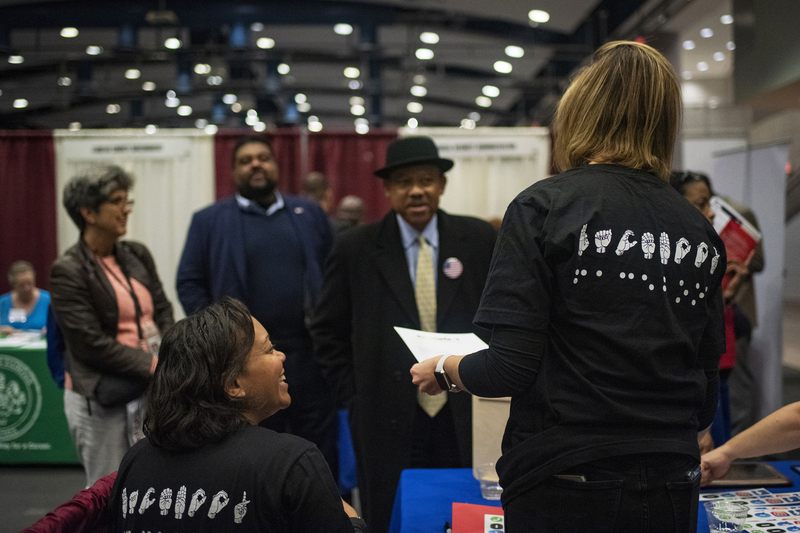 Job candidates with disabilities attend Careers & the Disabled magazine's career expo hosted by Equal Opportunity Publications in Washington, D.C. The co-founder of the Facebook group, Ernest Willman, saw this trend firsthand after he graduated in 2016 from Gallaudet University, a historically deaf college in Washington, D.C.
"My class mostly went to go to get master's," he said. "Sometimes because we can't get jobs, we have to get higher education to prove that we can do the job." Willman says deaf people still face the stigma that they are stupid or incapable — often referred to as "deaf and dumb." Maryam Hussein, also a member of the group, graduated in 2016 from historically deaf college RIT/NTID — Rochester Institute of Technology's National Technical Institute for the Deaf — after double majoring in graphic design and visual media. In the two years since, she says she has applied to more than 3,000 jobs. Now living in Chicago, her dream is to work in a gallery. But these days, she says any job would be good. She thinks she hasn't been hired because she has two disabilities. "Hiring managers were shocked to realize that I was deaf and in a wheelchair. I could see on their faces that they wouldn't want to hire me," she said. Every day she and her deaf friends ask each other, "Have you found a job yet?" Mostly, the answer is no. So Hussein returned to school. She is working toward her master's degree in mental health counseling with art therapy at Prescott College. It was a financial risk that involved taking out over $15,000 in loans. She's waiting to see if the gamble pays off. RIT/NTID's career center director, John Macko, said students need to advocate for themselves in every step of the job application. Finding the right interpreter is a crucial first step for many that Macko said can make a big difference. When a deaf person makes a call on video phone, a sign language interpreter is free — and randomly assigned. That means the interpreter might not understand the field a student is interviewing in. The U.S. Census Bureau estimates that fewer than 40 percent of those with a hearing disability work full time, according to its 2016 American Community Survey. One biology student hung up on nine different interpreters before finding one who knew enough about biology to interpret for her, Macko said. That student received a job offer. "I'm convinced that if she didn't hang up the first time, she wouldn't have gotten the job," he said. Proving discrimination as a deaf person can be extremely difficult, according to Howard Rosenblum, CEO of the National Association of the Deaf. Companies might interview a deaf candidate and provide interview accommodations, but won't actually consider hiring the deaf candidate, he said. Rosenblum has been a disability discrimination lawyer for more than 26 years. He says he rarely decided to take employment discrimination cases because, he says, instead of admitting discrimination, companies will make up other reasons to explain their hiring decisions. "They'll look like they're following the law," Rosenblum said. "The law right now is not very effective. The law says you can't discriminate and must provide reasonable accommodation, but how do you prove discrimination?" The current law that is supposed to prevent discrimination is the Americans with Disabilities Act (ADA), which went into effect in 1992. In the 26 years since, Rosenblum said it's unclear whether the ADA has had a significant impact on deaf employment rates. Technology improvements have made it easier for deaf people to bring attention to their employment struggles and file discrimination lawsuits, though litigating such cases can take years. Maria Morocco, a supervisory trial attorney at the Equal Employment Opportunity Commission, says that increasingly available accommodations give companies fewer excuses not to hire someone because of a disability. Currently, the EEOC is working on a nationwide case against FedEx on behalf of roughly 300 deaf workers who charge that they were not provided reasonable accommodations to perform well at their jobs. A FedEx spokesperson wrote in an email to NPR that the claims are "misleading and not founded in law." In 2015, the EEOC filed about 20 lawsuits on behalf of deaf plaintiffs. The total number of discrimination cases the EEOC received that year relating to hearing impairments was 827. In order for anti-discrimination laws such as the ADA to be effective, Rosenblum proposes two additional measures. The first is a quota for private employers, similar to the ones that currently exist for the federal government and federal contract employees. Private companies with federal contracts must hire people with disabilities for 7 percent of their workforce. Federal agencies have a higher quota of 12 percent, 2 percent of which must have a targeted disability such as deafness, blindness or significant mobility impairments. Rosenblum would also like to see businesses set up a centralized reasonable accommodation fund (CRAF) to help pay for any accommodations a new employee might need. "It removes the economic disincentive for hiring workers with disabilities," he explained. "Different departments may not have the budget for disability accommodations or may try to hire the cheapest people." More than 40 different private companies and government agency employers set up booths and chatted with prospective applicants at Careers & the Disabled magazine's career expo last November. At one table, Ryan Walters, a representative from the professional services company Deloitte, sat in his wheelchair and asked an attendee, "Are you familiar with Deloitte?" Walters has a cochlear implant. So did the attendee. Though Walters used spoken word, the attendee did not. Luckily, there was an interpreter, provided by Careers & the Disabled magazine. In every area of the expo, attendees signed to interpreters at various booths, conducting small interviews and introductions. For Shakeitha Stone, one of dozens of deaf attendees, it was a chance to interview with ease. She cracked a few jokes while discussing a job with the Environmental Protection Agency. Then she stepped away from the EPA booth with a smile. "I just had my first interview in four years," she said. "I'm praying, hoping I get a job." A previous version of this story incorrectly said Maryam Hussein's last name was Ameena.